Soil is the foundation of our civilisation its the single most important element of natural systems, it’s also the most complex element and the one we know the least about. It’s also the element we treat with the least respect we take it for granted and abuse it like a disposable commodity. Unless we are Permaculturist’s then it becomes central to our thinking and behaviour we seek to build soil and try to come to a greater understanding of the complexities of soil and the life within it. 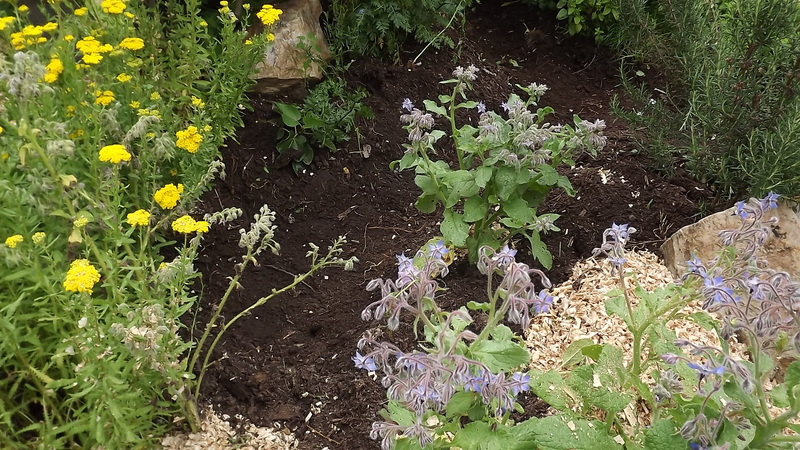 Soil is the mixture of minerals, organic matter, gases, liquids and a myriad of organisms that can support plant life. It is a natural body and it performs four important functions: it is a medium for plant growth; it is a means of water storage, supply and purification; it is a modifier of the atmosphere; and it is a habitat for organisms that take part in decomposition and creation of a habitat for other organisms. Soil is sometimes described as the „skin of the earth“ would you tear of your skin in an attempt to improve you’re health? No more likely you would seek to feed your body well in the hope that it would improve your skins ability to protect you. This is no different for soil if we feed the soil or in fact the soil organisms then we improve its ability to sustain plant life, improve its water retention properties and ability to purify water, improve its ability to store carbon and thus improve the habitat for the myriad of soil organisms within. 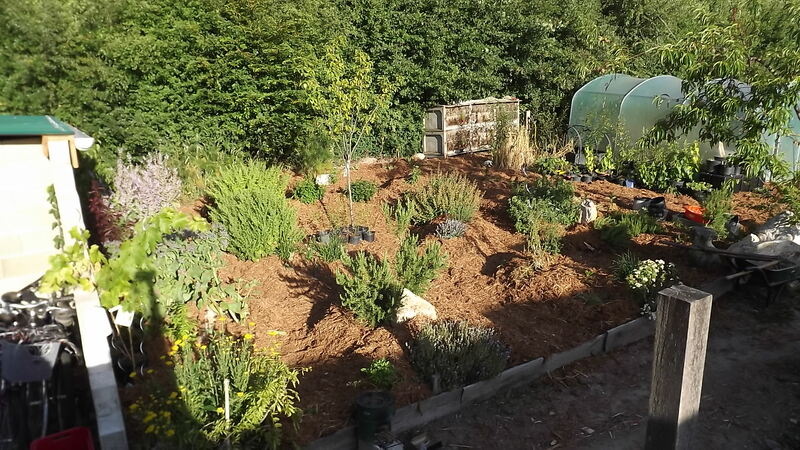 Once we start the soil building process we are helped by a positive feedback loop, each improvement leads to more plant growth and each annual cycle of growth leads to more organic matter from those same plants. 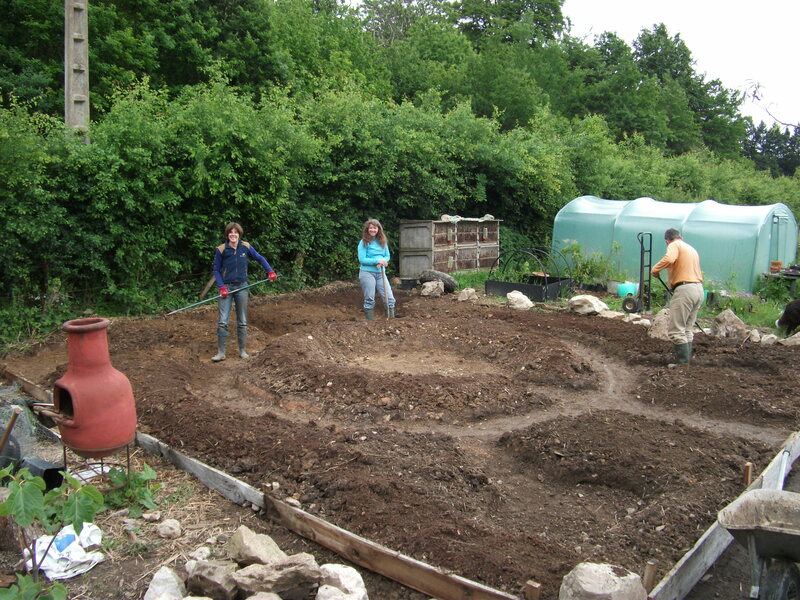 Back in 2010 we built a new herb bed first clearing and then laying out the new design, the site was an old timber firewood store when we arrived it was home to a huge colony of wood ants. Above you can see we are starting to lay out the design we have about 10cm of top soil before we hit clay this is typical for most of our site. 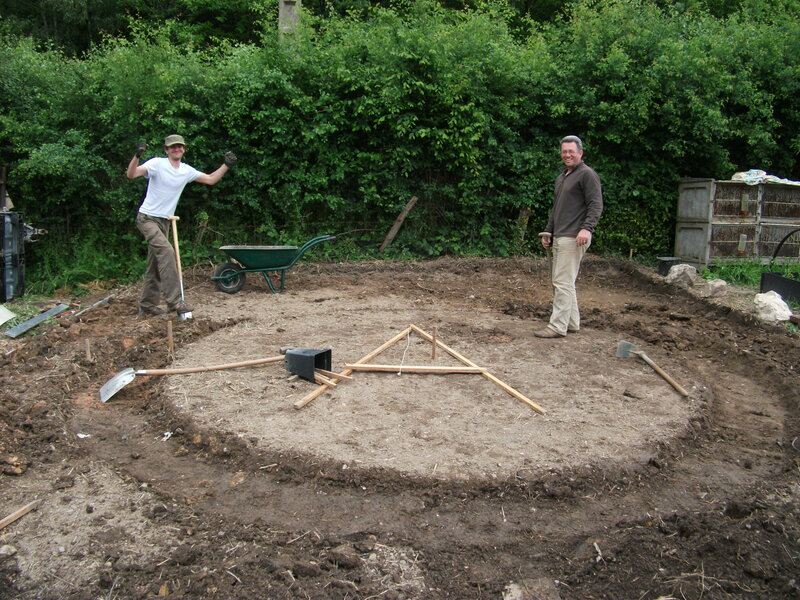 Once we finished digging out the paths and putting the top soil from them on to the beds to be planted we had doubled the top soil to nearly 20cm. 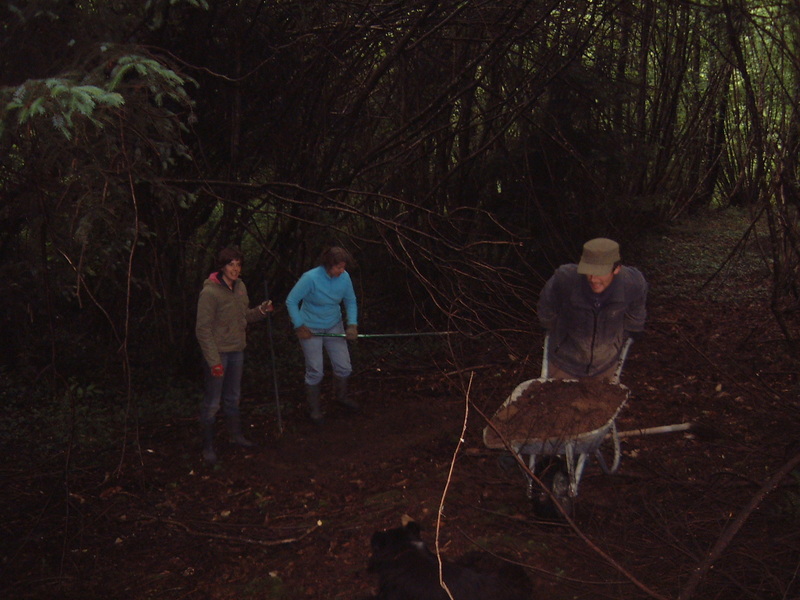 Then we added some soil and leaf mulch from the neighbouring forest, with permission of course. 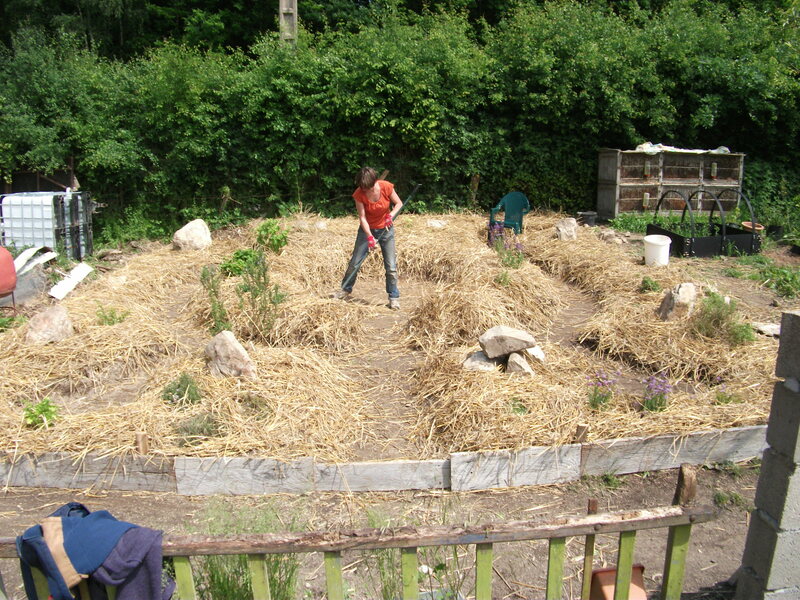 Then we planted and mulched everything with straw to conserve moisture. The next year all the straw was integrated in to the soil so we added well-rotted cows much to the beds for feed. 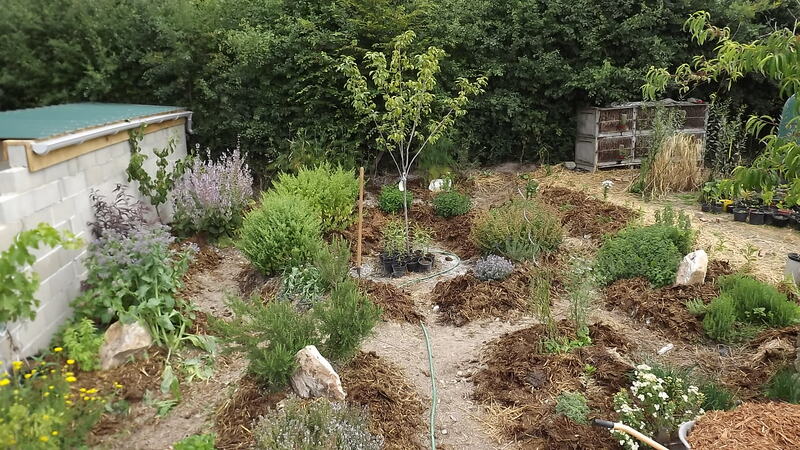 Then we mulched everything with oak bark chips. We have mulched every year with more woody material either shavings from the workshop or more bark from the local wood yard. This can of course lead to nitrogen leaching from the soil as the woody material decomposes, but we counteract this by watering with diluted urine from our dry toilets. The toilets separate the urine in to a watering can and we just dilute it at a rate of ten parts water to one part urine, this has produced exceptional results of herb growth with no discernible loss of soil nitrogen. Jetzt in 2014 we have 30cm beds of Black Gold to grow herbs in as well as Persimmons, Grapes, Figs, Peaches and Apricots and all in around 25 square meters of space. You can also see we are starting another layer of mulch of woody material this time from the workshop. these are shavings from making the window frames for our new cobwood cabin during our 2014 natural building course.